I'll grant you it doesn't look particularly good at first glance, but I actually played this mod when if first came out and it's actually a seriously good mod. Features include:male face pack, diplomacy team, improved battle morale and routing code, formations and formAI, additional weapons, native siege scene expansions, new town and arena scenes, new female combat sounds, a camp to look around, new meshes, new female sounds and faces, tavern animations pack, new map icons, working Eyelashes, new hair and aged textures for corprus faces, long caparisoned horses, and a lot more. And yes, some adult content that you can enable if you want to see warband boobies and run a brothel. I believe there's even more, but I can't really remember right now, and I pretty much just ripped the above info from the credits in the mod folder. Tl;Dr, give this mod a shot. It looks really stupid on the cover, I know. But it IS good. I need a serial key for Viking conquest before playing? Where exactly do i put this mod? Read the instructions when you download it. Will this work with 1.172 version? can you please add a kill count? Anybody know of a possible way to port this to viking conquest or at least the parts that take away gender checks and add polygamy? I'm trying to get the tavern/bath house to work but it says that scripts aren't working. Can someone tell me the appropriate files and where I should place them to get it to work? Also, when I play as a female I can't take any damage and when I cause damage to myself with cheats or do certain things as a female character, my game freezes up. Help with that? hey i've started playing this mod recently but i can't seem to get into any adult content. it's almost like i was playing plain diplomacy. i can't seem to find the "adult content" page either. >Place the Dickplomacy to Module folder while the WSE on Mount and Blade Warband. >Drag the WSE (If it have errors like it is outdated or whatever.) to your Mount and Blade.exe and surely it would show up the Dickplomacy module. >If you want your Adult option, Go to Module, Then to Dickplomacy. On Content Options, There's Adult Content. Go inside it. >Go inside again on adult folder. >Copy the Menu and paste it on your dickplomacy module. Wait, Nevermind... I just realized. The sexual part is not exciting anyway... I could tell you that. The only best part of this mod is almost EVERYTHING BUT THAT. Ok, I need help figuring this out. I need to the mod but all ready figured out the the part with bringing the "replacement" files over, and found the "Content Options" to activate it. I got two brothels in two different towns. Loaded the castles up with captured noble ladies... As well as loaded the garrison with all the different commoner females (about 5000) that I could locate. How the hell to I put them to work. I am starting to think I am missing a dialog somewhere or just doing something wrong. I build a lot of hate towards me for stealing all of the women, and I am determined to pimp them all out! Someone Please explain in detail, (if possible with video) How the hell do I employ women at the Brothels? So I can know for certain what I am missing. Oh I would like to know after all of this is figured out, how it would be possible to take this mod an merge it with other mods. (There is quite a few thing from a lot of mods that I'd like to take things from a put together for my own personal game-play if possible!) Oh yeah, the only exciting thing about the sexual part, is that they pay me 2500 to rail them each time. Never mind, I managed to get it to works I believe. Required re-downloading for some of the mod files as will as redoing a proper mb_warband.exe file for steam. But to the next big thing. How do I take the mod and increment it into another mod? What are the Key things I need. 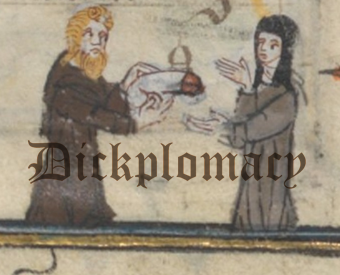 I want to cross breed this mod "Dickplomacy" along with something from "16th Century North Hemisphere", "Nova Aetas", "The Reckoning Third Stage", a pinch of "Prophesy of Pendor", and bit of the rule from "1257AD". I love this mod... Check this, I toggle the gender of every NPC in the game so that only the Special Dark Knight group and myself was the only Males in the game. So anyone can be put to work at my brothels. I completed all of the Claimants Quests to over throw the current Kings, but keep each one as my personal permanent prisoners. (To insure I don't lose them for my brothels later.) (I also admit, I use TweakMB to adjest the lords really liking me kicking their ***, like a lot.) Giving the Claimants only their Capital city as their own, so that I knew where everyone was going to pop up for their feasts. Then used each feast from the reborn Faction to marry every single noble lady available from each Faction. (Leaving any single lords S.O.L.) I thought about getting one of the claimants as a bride, but I wanted to Keep the full control of my kingdom, plus I wanted every lord as my eventual prisoner along with their wives. I started my Kingdom in the center of the map (Dhirim). I gave each of my wife that would not join my group party a village fief, after all their management upgrades where purchased. This granted me all the Loyal Generals I needed. I didn't want my main castle crowded with any extras other than my own wives, since it seem they are present regardless of where they are on the map. I am guessing this tactic seem to keep whatever I was doing to the the rest of my spouses' families a secret from them, or they just no longer cared. Sacked and flooded the castles with elite troops to keep the others scared of them. (2000 each) This was mainly to push all family members towards the Cities. Captured every lord from the area before taking the City, and keep the enemy wive to enslave out to the city castles, while the Lords do the same from the prison. When with all of the family member capture with the exception of my own wives, no one will try to ransom them back from me. (Commoners seem to always want the old king though.) When I finish capturing all the the Cities of the country, I move nobles around to all my citizens a variety of noble cultural flavor to tap as their hearts desire. The entire time, not one of my wives seem to drop below 99 Loyalty, and they also seem to take out the bandits before I got around to thinking about them. I also ensured not the let the claimant did not have a chance to escape capture. (Original Kings and Claimants disappear after they lose their factions.) So those where also included in my brothels' merchandise, since they were all females now anyways. I do Hate the fact that some reason asking a spouse to hire more staff can cause the screen to lock on her answering "What sort of staff member would you like to hire?" The image of her is still moving around, so it is not really frozen, but it sure the hell won't let you past that screen. Does this version work with a save from a previous dickplomacy version? Dickplomacy 4.3.0.7b has not been tagged yet.